Boil the potatoes in a saucepan, over medium-high heat, for 10 to 15 minutes or until just tender. Drain well. Heat the oil in a heavy-bottomed saucepan over medium-high heat. Add the garlic and fry for 30 seconds. Add the mustard seeds and the chili pepper, cover, and briefly allow the seeds to pop. 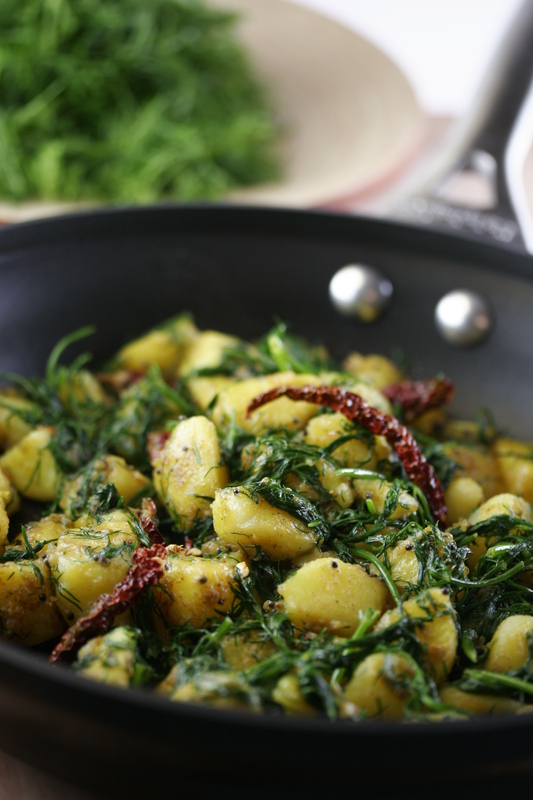 Stir in the potatoes with the curry powder and sauté until fragrant. Add the dill, cover, and cook over low heat for 5 minutes. Season with salt and serve hot.